The ruble-denominated MICEX index has gained 2.38 percent reaching 1,736, its highest level since July 2011. Markets rallied on rising oil prices, after Brent reached $58 per barrel. Calm took over the index after the initial spike, and the index settled at 1,722 points at 12:00pm in Moscow. The ruble gained more than 1.2 percent against the dollar at the opening of trading on the Moscow Exchange, with 65.77rubles now buying one US dollar. The exchange rate with the euro also improved to 75.34 rubles at 12:00pm MSK. Closely tied to oil prices, the ruble has been one of the most volatile currencies in 2014 and 2015. In 2014 it lost 46 percent against the dollar, a similar fall to the oil price in the same period. In the last week, oil jumped nearly 10 percent, making major gains since hitting a $45 per barrel low. Stocks in Russian banks and energy companies rallied Friday morning. Lukoil, Russia’s second-largest oil company, advanced 3.45 percent and Gazprom, the largest gas producer, gained 1.63 percent at 11:10 MSK. 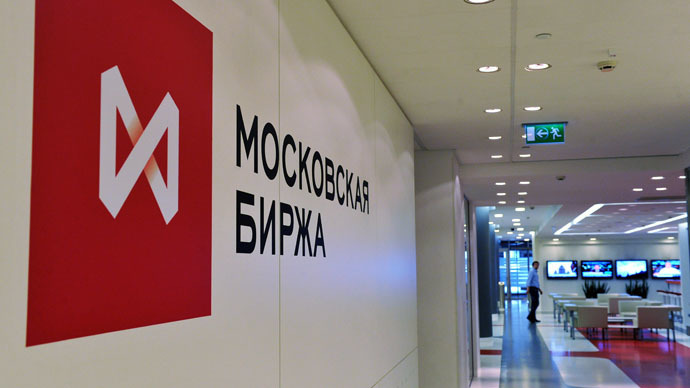 The country’s largest lender, Sberbank, added 1.76 percent, and VTB, the second biggest, added 1.83 percent at 11:10 MSK. Not only is oil underpinning the ruble’s value, sanctions, poor business investment, the Ukraine crisis, high inflation and low growth, are all contributing to the currency’s depreciation. On December 16, the ruble lost more than 20 percent of its value against the dollar in a day. It sunk the dollar-based RTS index plummeting by 12 percent, but slightly bumped up the MICEX, which gained 1.4 percent. The general economic prognosis for Russia remains gloomy, with the Central Bank of Russia predicting a worst case scenario of a 4.5 percent contraction.